Las Vegas, January 10, 2018 - Vivo, a leading global smartphone brand, has successfully attracted the attention of global electronics industry players by displaying the first In-Display Fingerprint scanner technology ready for production at the 2018 Consumer Electronic Show (CES) held in Las Vegas, USA. Continuing to lead with innovative breakthroughs, the futuristic scanner Vivo In-Display Fingerprint Scanning Technology offers consumers an unprecedented user interface experience and defines a new era of mobile. On the CES 2018, Vivo features a ready-to-use smartphone with the world's first in-display fingerprint scanner technology, demonstrating its commitment to delivering exceptional user experience to consumers. This technology allows users to open the smartphone through a touch of fingerprint, directly on the smartphone screen. Not only does it provide unprecedented mobile experience, this technology at once addresses the challenge of providing a better fingerprint authentication experience for smartphones in the future. According to statistics from Canalys global consultants, smartphone companies have distributed 22 million full-screen smartphones globally in the second quarter of 2017, rising to 700,000 in the first quarter of this year. UBI Research predicts that the minimal display trend of the bezel will continue to grow and increase by as much as 20% in 2017 and will be more than 50% by 2020. So far the fingerprint reader technology has become the most well-known and commonly used biometric for securing smartphones. As industry shifts to a new era of smartphones with full-screen display, it is natural that fingerprint scanning technology is also evolving to accommodate users' new habits and their need for a bigger screen without overriding the user experience. 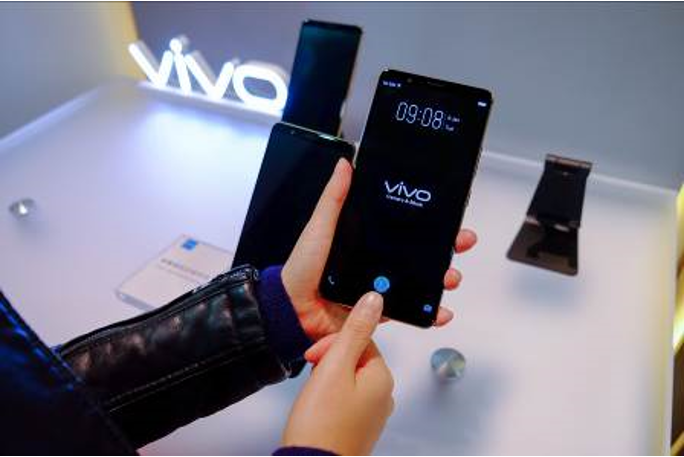 "With our efforts in comprehensive consumer research and long-term investment in technology research and development, Vivo is in a strategic position to be a pioneer in developing fingerprint scanner technology. We first presented the prototype of this fingerprint scanner solution at MWC Shanghai 2017 based on ultrasonic sensors and has committed to bringing this vision to the next generation of smartphones, "said Alex Feng, Senior Vice President of Vivo. "Today's event is to introduce a ready-to-use smartphone with an in-display fingerprint scanner technology that uses optical fingerprint sensors which is a big step in delivering what consumers have been waiting for, a futuristic mobile experience. "We are very excited to immediately present it in the midst of consumers as soon as possible", he added.